Generally, comparators are classified into various types such as electrical comparators, electronic comparators, mechanical comparators, optical comparators, sigma comparators, pneumatic comparators, digital comparators, and so on. These comparator circuits are typically used in designing electrical and electronics projects. 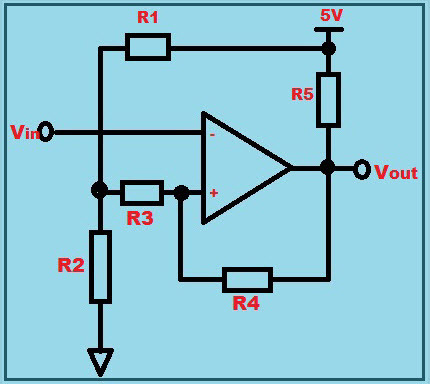 In this article, we discuss how to use an op amp as comparator circuit and working operation of op amp as comparator circuit. But, primarily we must know what is an operational amplifier and comparator circuit. The DC coupled electronic voltage amplifier with high gain, that consists of two input terminals is shown in the figure. The differential input is fed to the two input terminals (inverting input terminal and non-inverting input terminal) of the op amp and it produces a single output potential at Vout terminal. Thus, potential difference fed to its two input terminals is amplified for producing an amplified output. This amplified output is equal to hundreds of thousands of times of difference between the input signals. Even though there are various types of operational amplifiers, 741 op amps are frequently used as a comparator circuit in several electronics circuits. The device that consists of two input terminals, in which reference input signal is fed to one terminal and the actual value of the signal is fed to another terminal. Then, an output signal is generated at the output terminal based on the difference between the two input signals fed to the two input terminals. This generated output signal is either 0 (low) or 1 (high). In electrical and electronics terminology, the device used for comparing two voltage signals or current signals that are fed to the two analog input terminals, thereby producing one binary digital output signal to indicate the larger input signal is called as a comparator circuit. Generally, comparators are used in the devices such as relaxation oscillators, analog to digital converters (ADCs), and also in the devices that are used to measure analog signals. The comparators consist of high-gain differential amplifiers and we can use an op amp as comparator circuit. 741 operational amplifiers are basic operational amplifiers that can be used as a comparator circuit in many electronics circuits. For example, if we consider a temperature controlled switch; then switching operation is performed based on the temperature. If the actual temperature value exceeds the preset reference temperature value, then an output voltage (low or high) is produced by temperature sensor accordingly. If we consider the basic comparator arrangement, then there will be high frequency voltage variations caused due to noise. This problem is needed to be considered in case of operational amplifiers that are particularly designed as comparator circuits. 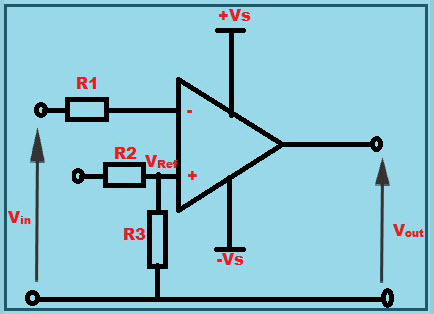 This noise is produced whenever the input voltage signal and reference voltage signal are close to each other. The high frequency voltage variations are caused due to the random nature of noise, due to this, in rapid successions, the input signal voltage becomes greater than or less than the reference voltage. Thus, the output signal will oscillate between its maximum voltage level and minimum voltage level. This problem can be reduced by applying hysteresis. We can adjust the hysteresis gap in the Schmitt trigger circuit arrangement by applying hysteresis to an op amp comparator circuit using positive feedback. The figure shows op amp as comparator circuit with hysteresis. In general, the output of an Op amp fluctuates positive and negative to extreme voltage that is approximately equal to the supply potentials. If a 741 op amp is connected to a +/-18V, then the maximum output voltage is given as +/-15V. This is due to the extreme high open loop gain of the op amp (10,000 to 1 million). Thus, if +/-150 microvolts of voltage difference is created by any input, then it will be amplified approximately by one million times and output is driven into saturation. Thus, the output remains at its maximum or minimum value. While using op amp as a comparator in instrumentation, the open loop can be used to compare the two voltages. Therefore, depending on the difference between the input voltage value and the reference voltage value, the output Vout will be equal to the maximum high value or minimum low value (input voltage value will be greater than or less than the reference voltage value few by micro volts). The reference voltage is fed to non-inverting input terminal of the op amp and variable voltage is fed to inverting input terminal of the op amp. Consider the op amp comparator circuit diagram shown in the figure, if the voltage fed to pin 2 is greater than the reference voltage fed to pin 3, then the output voltage becomes low and it is marginally greater than –Vs. If the voltage fed to pin 2 is less than the reference voltage fed to pin 3, then the output voltage becomes high and it is marginally less than +Vs. There are many op amps dedicated for comparators operation, these op amp comparator circuits are used for high speed comparisons. 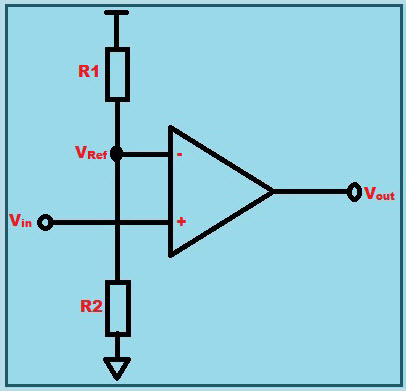 The output state of these op amp comparator circuits changes in less than 1 microsecond. But, these high speed comparing op amp comparator circuits consume more power, depending on the speed of comparison. Based on the speed of comparisons and the amount of power consumption, these comparators are classified into different types. The specific op amp comparator can be used for a particular application depending on the required speed and/or power consumption. 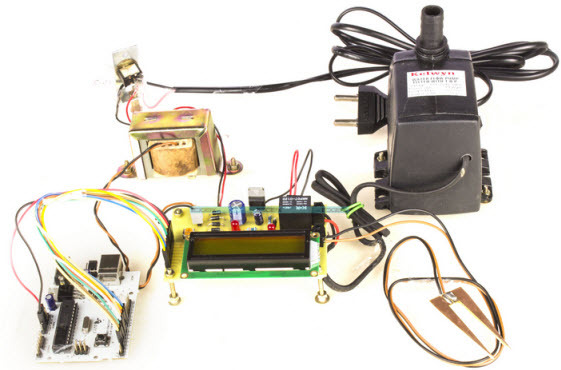 The temperature humidity monitoring system of soil based on wireless sensor networks using Arduino project is designed for developing an automatic irrigation system that controls the switching operation (on and off) pump motor by sensing the soil moisture content. The sensing arrangement senses the moisture of soil and appropriate signal is given to the Arduino board. This is achieved using an op amp as comparator circuit acting as interface between sensing arrangement and microcontroller. Based on the signal received from the sensing arrangement, the water pump is operated. The LCD display is used for displaying the status of soil moisture content and water pump. Furthermore, technical assistance can be provided based on your queries posted in the comments section below. You can download our free eBook to design electronics projects on your own. Do you know any embedded systems applications in which op-amp is used as comparator circuit? Next › How to find out the Resistance Value using Resistor Color Code Calculator?